As more content curation tools are being released, will you use a free application, a paid service, or a combination of tools? Some content curation tools have great built in aggregation, and some make it easy to share across different platforms. Pearltrees features automated sharing on Facebook and Twitter, bookmarklet extension to make it easier to curate content you come across on the web, and you can visually organize your collections. Scoop.it's built in content aggregator searches through tons of sources everyday. It also has a bookmarklet so you can curate, or "scoop," webpages. The free version of Scoop.it allows you to curate up to 5 topics and easily share "scooped" stories on Facebook, Tumblr, Wordpress, and other sites. Don't overlook Pinterest's pinboards or applications like Tweetdeck for Twitter based curation. Web Advantage has curated a list of over 30 content curation tools, compare features and sign up for a service. What service, or services are you going to be begin with? For the initial stage of the curation I will most likely use a WordPress blog or something along these lines to create a listing of all the available sources. From here I would like to expand the list into categories. Then I will focus on the most sought after categories and try to add these images directly to Scholar Commons, our institutional repository. From here I will link these images to an active campus map. The end goal is to allow users to see a timeline of images in a particular location on campus. on Aug. 19, 2014, 12:58 p.m. I use a combination of Feedly, Digg and Digg Reader, Pocket, Kippt and Flipboard. These are my tools for content curation. on Aug. 3, 2013, 4:15 p.m.
on May 7, 2013, 5:32 a.m.
on Jan. 28, 2013, 3:23 a.m. I'm using Pearltrees to make a mindmap of web resources for science education. on Jan. 23, 2013, 4:55 a.m. The main advantage with respect other mind map tools is that this one allows cycles between concepts (nodes), so you can really tailor a network of concepts instead of just a tree. on Dec. 17, 2012, 5:40 a.m. I tried Diigo... but because I use different computers, different operating systems, I could not get along with it. No criticism of the product.. just me as a user. I have just installed Archify. I also use google bookmarks, but go annouyed with that when I accidently deleted all my bookmarks. Fortunately I had exported a copy, but there is no way to import the HTML list. Being locked to Google Chrome is annouying too. For collaborating and sharing ideas I tried MindMeister. My cohorts were not so IT savvie and it did not work. on Dec. 11, 2012, 10:37 p.m.
As I am familiar with Pinterest, I will be using Pinterest. However, I also want to try something new. I have been reading about PearlTrees and Diigo, and I want to give those a try. on Nov. 25, 2012, 2:16 p.m. I am curious about Pealtrees and will give that a try - though I will likely also continue to share some content via Twitter & FB. on Nov. 8, 2012, 10:06 p.m. I'm personally a fan of Citelighter because not only does it save information into a single place, but allows me to save all bibliographic information. To go even further- on each article/passage I save, I can add notes/comments to it. on Nov. 5, 2012, 4:14 p.m. I guess you already know other alternatives for bibliographic management. In case you might not know other alternatives, you can also use Mendeley, Academia.edu and Zotero. They combine bibliographic storage as well as social network capabilities, so you can know what similar to you, are researching. In this way you can have the community working for you to keep you updated in the topics you follow (in a similar way to Delicious, but in this case focused on research). I think I'll use a combination of Delicious, Pearltrees and Instapaper. I'll use Instapaper as a repository to store those papers and documents I want to read later. Although I'm not sure if I'm going to use it in the future, since the features it offers can be already obtained by means of bookmarks in Google Chrome, once you set up automatic synchronization of Chrome between machines. The only missing feature would be sharing to social media, but that's also easily obtainable. Delicious and Pearltrees are two tools that I already use. Delicious can be used to easily discover new content. Pearltrees offers an interesting interface to store and discover new sources and, lastly, they seem to have improved it (at least it seems more usable in terms of speed). 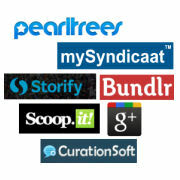 I've reviewd the list of curation tools offered by the linked article. From the 60 tools (30 in the linked article and 30 more from a second part that can be fetched from the former article), only 5 convinced me to pay a closer attention: Bundlr, BagToWeb, Scoop.it, Diigo and StoryCrawler. From these, StoryCrawler I was unable to open a new account a use it. So I can't really assess its usefulness. BagToWeb, from my point of view, does not offer features beyond what Delicious or any curation tool that provides tags to create a folksonomy. The most interesting feature is linking bags, but that can be also obtained with tags, although the metaphor of bags is more user-friendly to understand how to classify things. Bundlr is pretty interesting. Similar to delicious, it has a nice front-end and a visually appealing way to present content. It also offers you the possibility to know how many people have visited your bundle. Finally, Scoop.it, which I think it has interesting features, although I couldn't see how these could help me. on Nov. 1, 2012, 1:35 p.m. I think I'm going to use bag the web because it creates a bag to collect, publish, and share any content from the Web. You can share bags. I am going to use pininterest for images since I already have an account with them. I amy use tweetdeck too. Topic " best places to take fall foliage pictures on the east coast"
on Sept. 24, 2012, 9:34 p.m.
on July 16, 2012, 7:53 p.m. I didn't like Pearltrees either. Scoop.it has been my favorite, and I have been using Springpad some, it works like Pinterest, but has a couple a different features (not saying it is better, just slightly different). As I mentioned earlier, tumblr is my tool. Tumblr is already being a tool for many curations and my blog is specificlly addressing images, I find it fits my purpose. Also, I have restricted it image alone posts. This makes my blog exclusively read through images and invite a dialog of images. on July 5, 2012, 1:31 p.m. I have a paper.li account and am starting a scoop.it account. on June 19, 2012, 1:58 p.m. I have a Paper.li account tied to my Twitter stream thatI like to browse through. It's tied to the Tweets that Irish educators use called #edchatie. When pulling together all of the Tweets from our Monday night, weekly discussions, I used a service called called Tweetchat originally, but now use a web-based service called chirpstory. In order to keep all of these recorded chat sessions in the one location I create PDFs of them and store them on a PBWorks Wiki. To keep a tally of when the page is viewed, I use another service called Delivr, which also creates a QR code and a short-link and gives me innumerable stats about those who access that particular page. Goo.gl would do similar. I do have accounts for some of the other services entioned in the article linked to above (and the further "30 more curation services article" too, but don't use them as much. I find I use services that comunicate back to me, more than I need to go to them. As I check email daily, an email reminder from a service is invaluable. on June 17, 2012, 11:42 p.m.
on May 10, 2012, 3:22 p.m. I want one that allows me to simply right click on whatever I want in my collection, and a menu pops up that asks me what section to save it in. I want it saved locally on my hard drive and optionally in the cloud. I want it to be FOSS so I don't have to worry about having my data held hostage by a company. on April 29, 2012, 5:24 p.m. I have only used web based applications- however, I recently read an article that mentioned Curator's Workbench and Archivematica in passing. I haven't gotten a chance to check them out yet, but they may be similar to what you are looking for... If you find any other helpful tools, please feel free to share- good luck on your project! atypican - http://www.zotero.org/ might be an interesting tool for you to look into. Thank you SO much. Seriously! Its even GPL I can't believe it. I already use Storify and Pinterest. Have tried Paper.li but gave up. I think I'll try Scoop.it for a new experience. on April 18, 2012, 6:41 p.m.
Me too, to all of the services you mention. I have got back into using Paper.li in the last month or so. Have allowed my Pinterest account to gather dust-was setting it up based on famous artists as thought it could be a good way to pull together info for use in classes in school in Art History as it's very visual. Liked the idea of Sorify, but didn't spend enough time on learning to use it. on March 20, 2012, 10:17 p.m.